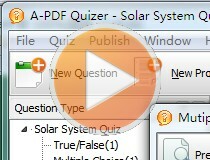 A-PDF Quizzer is a ultimate flash quiz creator tool that helps to build multiple types quizzes and publish online. A-PDF Quizzer provides different quiz types for you to choose, True/False, Multiple Choice, Multiple Response, Fill in the Blank etc. With using A-PDF Quizzer, you are also able to add images, video, equation, sound for each question, and publish the created test on your website instantly. 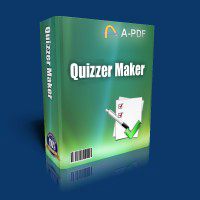 A-PDF Quizzer is designed to give quiz designers the ultimate flexibility in making quizzes. A-PDF Quizzer programs offer a quick, easy-to-use and affordable way to create your tests, online quizzes, surveys, interactive exercises, multiple choice quizzes and assessments with flexible publishing options for easy result tracking - ready for the Internet or as free-standing executable files for distribution to your students, your friends or business colleagues and customers. In less than 10 minutes you can create and compile your quiz as a .html file. Offers all the basics - things like customizing visual appearance, inserting images, applying your logo, shuffling questions, and more. Easy Create quizzes with friendly-to-use interfaces. Provide different quiz types: True/False, Multiple Choice, Multiple Response, Fill in the Blank, Word Bank, Matching, Hot Spot, Matching Drop Down, Sequence Drag and Drop, etc. Offers build-in templates, flashes, or you can highly customize unique style templates. Add images, videos, equations, sounds for each question. Add customized text or image watermark to quizzes. Define quiz information about quiz font, backgrounds, tool bar info and Flash info. Set passing rate for quizzes. Define point, right and wrong tips for every quiz. Link to some webpage after finishing the quiz. Save project for later continue editing work. Publish created quiz with outputting in mode Web, Zip, Exe. Enable print out created quiz pages while testing. View test result after submitting instantly, or send results via emails to people directly after completing. Check answers with reviewing feedback. Create quizzes and save as project for later use. A-PDF Quizzer provides wizard-like interfaces for you to create quizzes and services with ease, and it doesn't require any technique knowledge. All you need to do is just presenting your questions and answers directly. 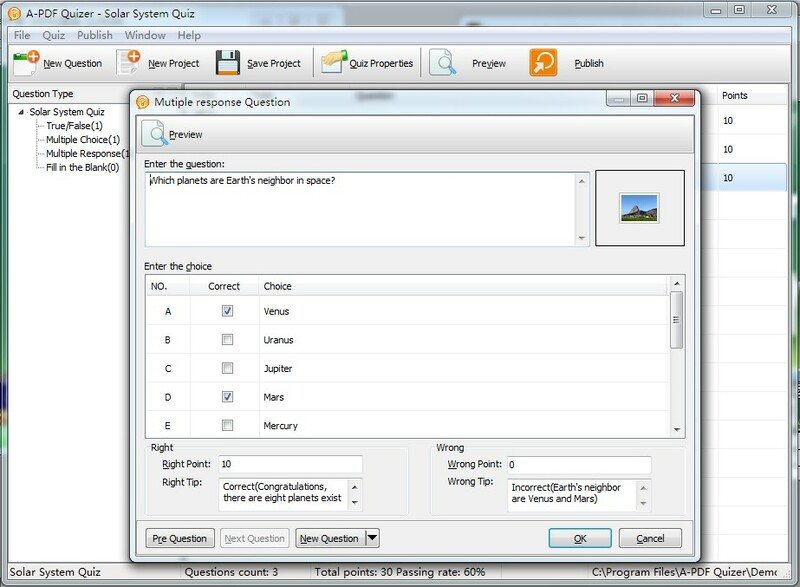 A-PDF Quizzer is a standalone program costing only $39.